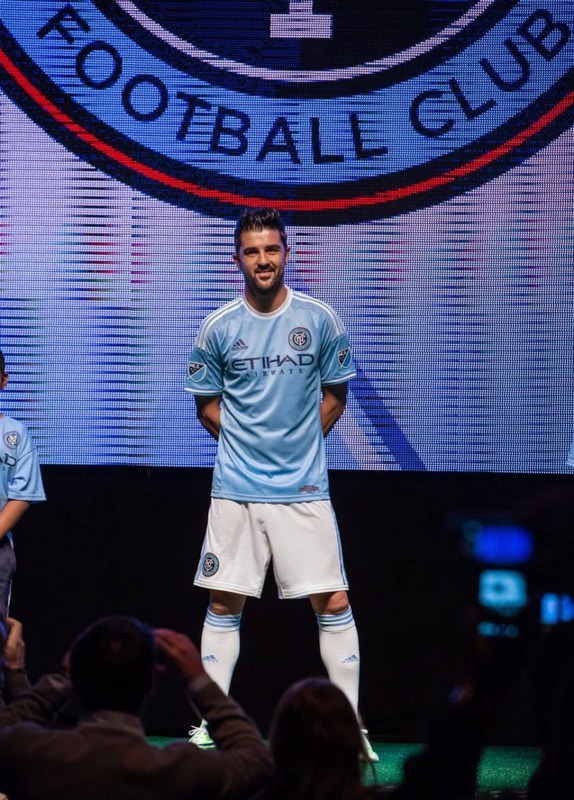 Okay, in the days since New York City FC unveiled its shirt, a lot of digital ink has been spilled reviewing them. I'm not immune, so here's my take. On the whole, I like it. I love the color. I know there are some who were hoping for navy blue, or were fooled by the teaser images into thinking that it would be black, but there's never been any doubt in my mind that the home shirt was going to be sky blue. Sky blue is a bright color, a vibrant color, but more importantly it's a color not used by any professional clubs in New York City. We can own it, make it ours. When you see footage on television of hundreds of cheering fans wearing sky blue, there won't be any confusion as to whom you're seeing. Even as an Arsenal fan, I don't mind that the color scheme is associated with Man City. Nor do I mind that it is reminiscent of Man City shirts of the past few years; they were obviously going for a timeless, clean look (well, as clean as you can get with those Adidas stripes, in any case). Nike has done a great job doing just that for Manchester in recent seasons, and there's bound to be some overlap. They went with white accents, which Nike used a couple seasons ago. Had they used blue, then that would be too close to the current MCFC kit. Orange? Interesting; the club never uses orange and sky blue next to each other. The orange is always bordered by navy, as seen in the crest. I don't know if that is a hard-and-fast rule, or just the way their designs have happened to work out, but I've noticed the pattern. Of course, this being the 21st Century, there are Easter Eggs and small details, to which the club helpfully provided a map. I love the Inaugural Season logo, designed by Matthew Wolff. That's already made its way to tshirts; I'm sure we'll be seeing lots more of it for the next year. I also like the new MLS numbers. 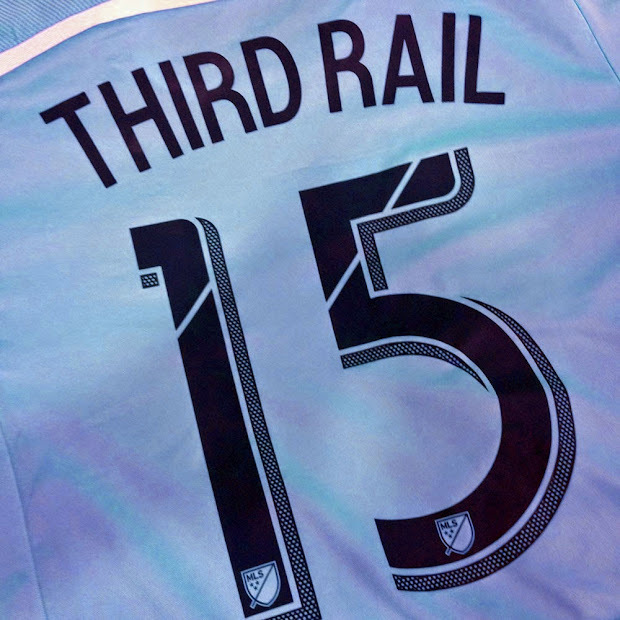 It's the same number font used for the past few seasons, with the old "boot-and-ball" logo swapped out for the new MLS shield and diagonal lines representing the "MLS Next" slash. Speaking of the new logo, I also like putting them on both sleeves. The flag patches never looked right to me, given the different international commitments of so many players. Keeping the league logo in each club's color palette also looks good to my eye, especially with a relatively clean shirt like this one. 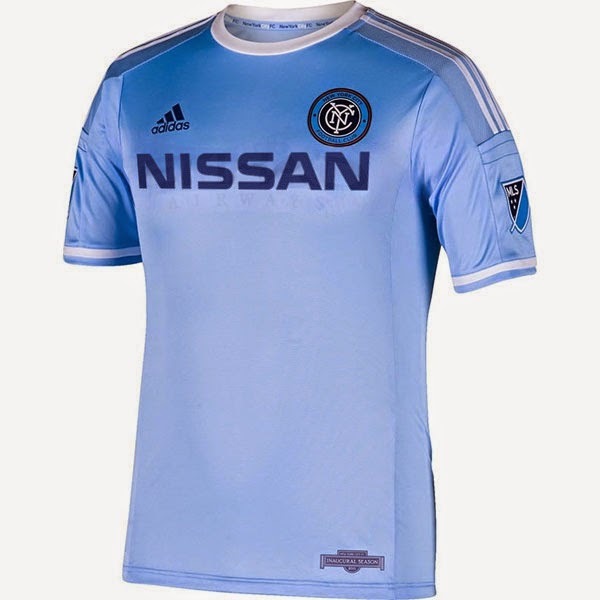 It doesn't have the four extra colors muddying it up, instead it's streamlined with the NYCFC's signature double-blues. Which leads me to the one element that I really don't like: the sponsor. I wrote back in March that Etihad was going to be the sponsor, and that it wouldn't make any sense. 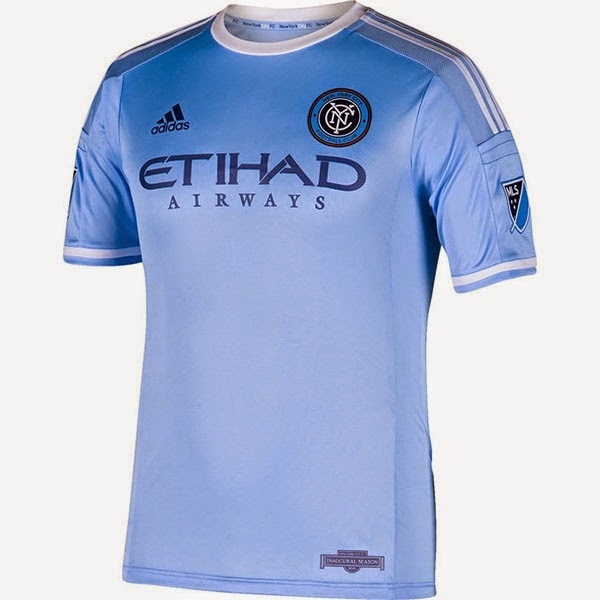 I stand by that today; it makes slightly more sense for Etihad to sponsor NYCFC than it does to be the "official airline partner" of the league. 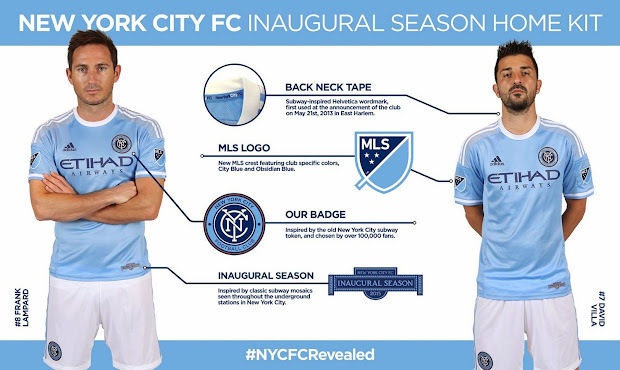 At least they actually fly out of New York, which can't be said of most MLS cities. But my problem with the sponsor runs deeper than that; the sponsor logo is by design the most prominent element of the shirt, and this is where they're inviting comparisons to Manchester City. Had they signed a deal with another corporate sponsor such as Nissan, their "Official Electric Vehicle Partner", they would have killed the "Jr. Man City" meme in its tracks. Nissan is a brand with ties to this city, as they manufacture the "Taxis of Tomorrow" now taking the streets. Now obviously, I understand the ownership issues at play. But this move strikes me as unfortunately tone-deaf, a rare instance where policy is being set in London, not New York. Still, I take a long view on these matters. I'll be a fan well after the Yankees get bored and sell their piece of the club, and after City Football Group decides to put its money elsewhere and sells their stake. Given that, I can look beyond the unfortunate sponsor. Which leaves us with a classic shirt, befitting our club in their inaugural season. Now I can't wait to see the road kit.